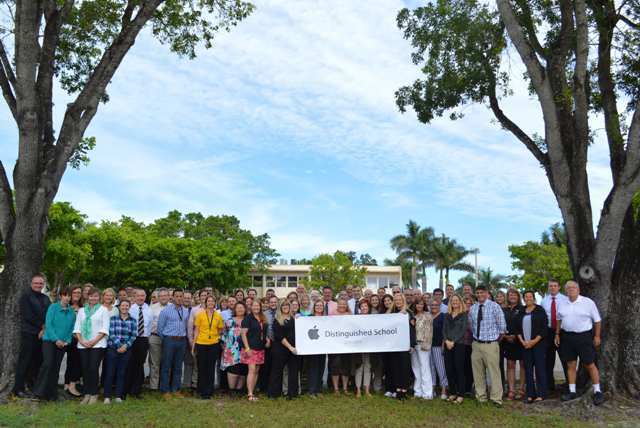 Bishop Verot Catholic High School is pleased to announce it has been recognized as an Apple Distinguished School for 2017 – 2019 for its complete integration of the 1:1 iPad program and the creation and implementation of an advanced learning environment charting a dynamic direction for student learning. Apple Distinguished Schools are centers of innovation, leadership, and educational excellence using Apple products to inspire creativity, collaboration, and critical thinking. They showcase innovative uses of technology in learning, teaching, and the school environment and have documented results of academic accomplishment. The selection of Bishop Verot Catholic High School as an Apple Distinguished School highlights our success as an innovative and compelling learning environment engaging students and providing tangible evidence of academic accomplishment. While maintaining our Catholic traditions, teachers and administrators realize in order to teach tomorrow's creative thinkers and problem solvers, it is necessary to use current technology taking us beyond the limited walls of the classroom. With the use of the iPad, students can research scientific principles, link to real world applications, and create graphs, timelines, and surveys based on their findings. Teachers present podcasts recorded in Ivy League lecture halls while refining students' communication skills. While students continue to improve their traditional skills in writing, mathematics, and science, the iPad has allowed students to broaden their learning style to include employability skills such as communication, professionalism, problem-solving, and teamwork. Content initiative, creativity, and community involvement share a common focus in our modern curriculum.